David Watkin has made a wide range of acclaimed recordings including Sonatas by Vivaldi (Hyperion) Beethoven (Chandos) and Francis Pott (Guild), Haydn’s Sinfonia Concertante with OAE (Virgin) and Schubert Quintet with the Tokyo Quartet (Harmonia Mundi). He has been a soloist at Wigmore Hall, Barbican, Royal Festival Hall, Queen Elizabeth Hall, Carnegie Hall, New York and performed the Schumann Concerto with Sir John Eliot Gardiner and Orchestre Révolutionnaire et Romantique at Lincoln Center, New York. As a guest artist he has collaborated with Robert Levin and Fredericka von Stade. As a founder member of the Eroica Quartet he has performed all over Europe and the USA and their recordings of Beethoven, Mendelssohn, Schumann, Debussy and Ravel have astonished critics. Unaccompanied Bach has taken him all over Europe, from Bach’s birthplace in Eisenach to the Palace of Frederick the Great at Potsdam and the Prague Spring Festival. He also featured in Sir John Eliot Gardiner’s BBC programme Bach: A Passionate Life. His recording of the ‘Cello Suites (Resonus) won a Gramophone Award and was nominated for a BBC Music Magazine Award. The Guardian judged it second in the top ten musical events of 2015 and it was The Herald’s number one CD. David Watkin read Music at Cambridge whilst studying the ‘cello with William Pleeth and singing with Kenneth Bowen. Whilst at university he began to revive the eighteenth-century practice of realising figured bass (improvising chordal accompaniments) on the ‘cello. 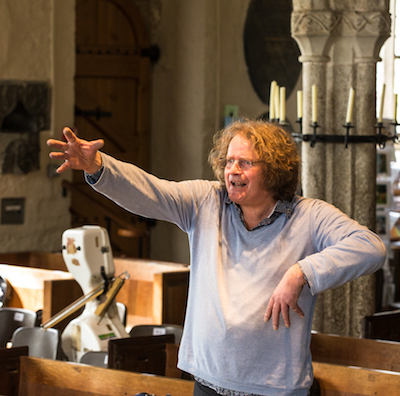 He has since used it as a ‘repetiteur’ instrument in Mozart Operas with Mackerras and SCO (DG) and OAE (Chandos), as well as in orchestral music, and sonatas by Corelli with Andrew Manze (Harmonia Mundi) and John Holloway (Novalis). His writings about this, and other aspects of music have been published by Early Music, The Strad and the Cambridge University Press volume entitled Performing Beethoven. He is now focussed on conducting and teaching, to both of which he brings decades of music making at the highest level. As principal ‘cello in some of the world’s leading ensembles - English Baroque Soloists, Révolutionnaire et Romantique, the Orchestra of the Age of Enlightenment, the Philharmonia Orchestra and the Scottish Chamber Orchestra - he has played a key role at the heart of some ground-breaking performances. As well as formal study of conducting he has worked under, and received guidance from some of the leading conductors of the age. He has conducted groups including the Scottish Chamber Orchestra, Royal Scottish National Orchestra, Swedish Baroque Orchestra, Academy of Ancient Music, Manchester Consort, Meadows Chamber Orchestra, and was Assistant Conductor to Robin Ticciati at Glyndebourne Festival Opera. He has conducted ensembles at the Royal Academy of Music, the Guildhall School of Music and Drama, Royal Welsh College and the Royal Conservatoire of Scotland. After conducting the European Union Youth Orchestra ‘Campus’ orchestra at Grafenegg, he has been invited back to conduct the main orchestra in a performance of Mahler’s Symphony No. 1. David is now Head of the Royal Conservatoire of Scotland’s String Department which he has helped to transform into one of the most innovative programmes of study in Europe.